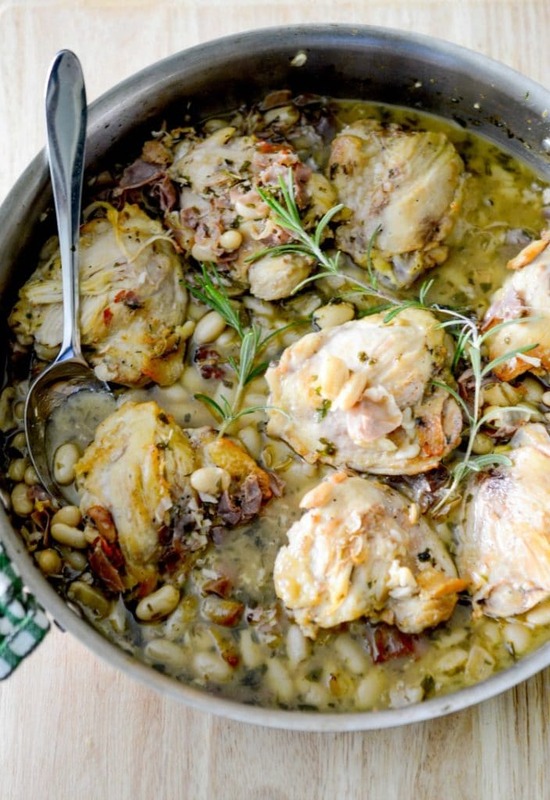 This recipe for Chicken with Prosciutto, Rosemary & White Beans in a white wine sauce is deliciously flavorful and the best part is you can make it all in one pan on top of the stove. 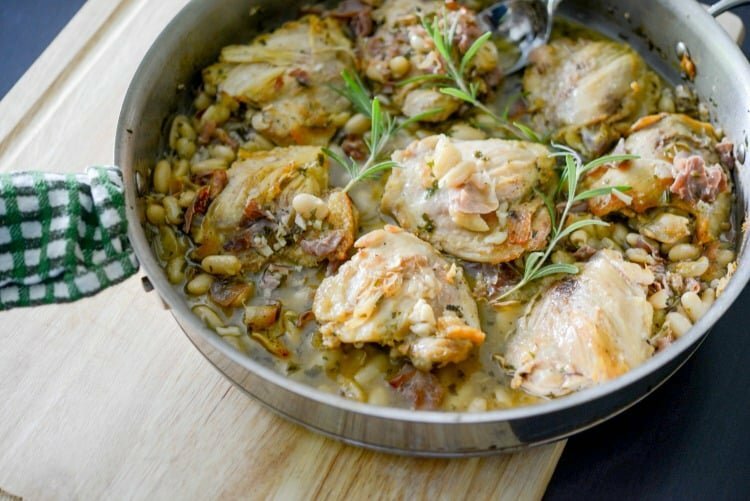 I recently saw a recipe in the Cooking Light magazine for chicken with beans and decided to experiment with my own version and came up with Chicken with Prosciutto, Rosemary & White Beans. I’ve seen so many recipes in magazines and on Pinterest lately for one-pan meals; in fact I even started my own board called One Pot Meals for it. I love the idea of dirtying as little dishes as possible because I HATE doing the dishes. Strike that. I don’t hate washing the dishes, I despise drying and putting away the dishes; washing isn’t so bad. And when I get on a roll in the kitchen and I’m making three or four recipes at the same time, the sink piles up so high that I have to wash and dry in between which really slows me down. Anyway, back to this chicken dish. I made this recipe several weeks ago and was going to wait to share it with you until the Fall; however, I said to myself ‘Why not now?’. Most people don’t like to turn the oven on during the hot Summer months anyway (only us crazy food bloggers who prepare recipes for September in July). 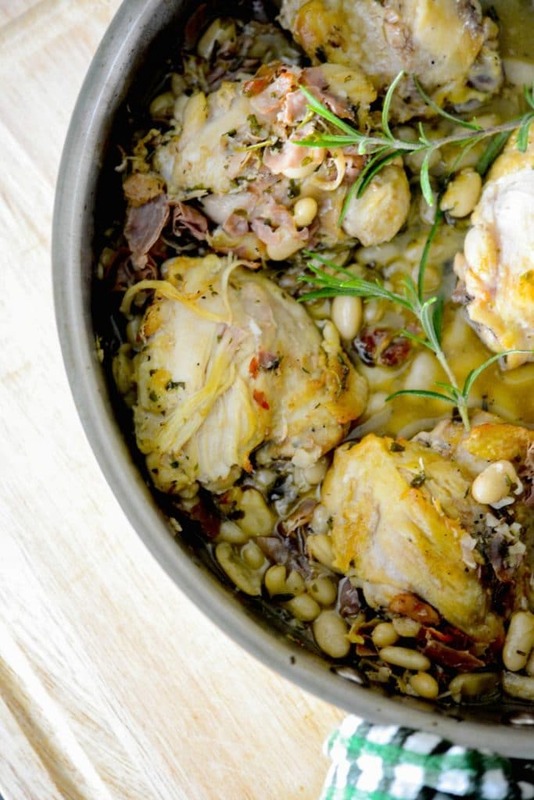 For this recipe you’ll need bone-in chicken thighs (or legs), prosciutto, fresh rosemary, garlic, white wine, EVOO and Cannellini beans. See, flavorful meals don’t need to have a lot of ingredients! First start out by adding the oil to a large frying pan; then brown the chicken. 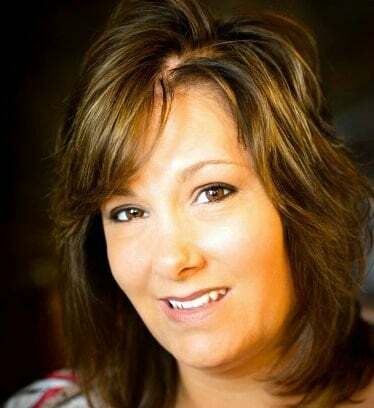 You may have to do this in two phases depending on the size of your pan. Remove the chicken once browned on both sides and keep covered with foil. Next, add chopped prosciutto and garlic and sauté for 1 minute until the prosciutto starts to get crispy; then stir in the white wine, rosemary and beans. 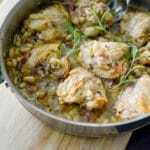 Place the chicken back into the pan, nestling it on top of the beans; then cover the pan and reduce heat to low. Simmer 20-30 minutes until the chicken is cooked through. My family and I really loved this recipe for Chicken with Prosciutto, Rosemary & White Beans. The flavor combination was incredible; though I’m not surprised because rosemary is my all-time favorite herb to cook with. This recipe makes enough to feed 4-6 people and you can serve it with rice and a tossed salad. ~Enjoy! Heat oil in a large skillet over medium high heat. Add the chicken, season with salt and pepper; then brown the chicken approximately 5 minutes per side. You may have to work in batches. Remove the chicken from the pan, set aside and cover with foil. Add the prosciutto and garlic and saute for 1 minute; then add the rosemary, white wine and beans. Mix well. Add the chicken back to the skillet on top of the beans, cover the pan and reduce heat to low. Cook for an additional 20-30 minutes until the chicken is cooked through. This sounds fabulous! I’m wondering what you think of using chicken breast instead of thighs/legs. I don’t really care for dark meat and never have it in my freezer. I’m sure you could use boneless chicken breasts, but you will have to adjust the cooking time so that you don’t dry out the chicken. Enjoy!